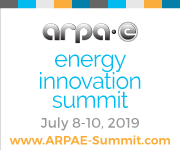 Below you will find 2019 ARPA-E Energy Innovation Summit promotional materials. Check out suggested social media posts (for Twitter, Facebook, LinkedIn) organized by month. You will also find Summit logos and web banners, newsletter promos, and promotional email text. All logos, web banners, email text, social media suggestions, and additional collateral may be used to promote the ARPA-E Energy Innovation Summit and/or your organization’s presence at the Summit. Don’t forget to use #ARPAE19 to join in on the conversation! Please use the hashtag #ARPAE19 to continue the conversation. 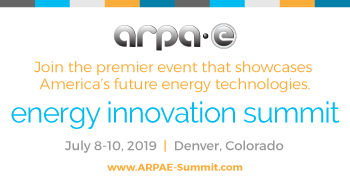 The 2019 ARPA-E Energy Innovation Summit: All of your favorite programming, followed by an innovation excursion to @NREL! Register and learn more now: www.arpae-summit.com. 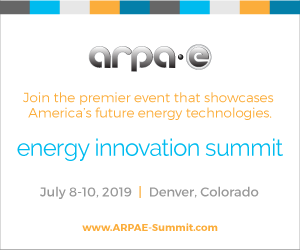 The 2019 ARPA-E Energy Innovation Summit: All of your favorite programming, followed by an innovation excursion to NREL! Register and learn more now: www.arpae-summit.com. Calling all energy pros interested in transformational tech! 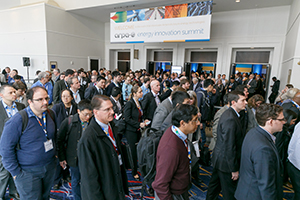 ARPA-E welcomes you to join the nation’s top energy innovators, investors, and entrepreneurs for three days of technology demonstrations, discussions of the most important energy challenges facing America, and one-of-a-kind networking opportunities. This milestone event marks 10 years of making ideas into reality, and sets the stage for the next decade of innovation. To download the images, right click on the image and select "Save As". If posting the below images on a website, please link to http://www.arpae-summit.com. *If you need any special size images beyond what is listed below, please contact Sommer Jackson at SJackson@eventPower.com. The Advanced Research Projects Agency-Energy’s (ARPA-E) Energy Innovation Summit is the premier event of the year for energy innovators, investors, and influencers. Set for July 8-10, 2019 in Denver, Colorado, this annual conference gathers thousands experts from government, academia, and industry to advance cutting-edge energy technologies. The 3-day program features inspiring keynotes, practical seminars, a technology showcase with 300+ innovative technologies, and targeted networking opportunities. ARPA-E is an innovative and collaborative program within the U.S. Department of Energy that brings together America’s brightest scientists, engineers, and entrepreneurs to support transformational energy technologies through funding, technical assistance, and market readiness. ARPA-E chose to move 2019 Summit to Denver to take advantage of all the energy work happening in the western states. Denver is an energy innovation—home to a thriving and collaborative community of technology investors and entrepreneurs. Visit http://www.arpae-summit.com for more information. The Advanced Research Projects Agency-Energy’s (ARPA-E) Energy Innovation Summit is the premier event of the year for energy innovators, investors, and influencers. Set for July 8-10, 2019 at the Gaylord Rockies Convention Center just outside Denver, Colorado, this annual conference gathers more than 2,000 experts from government, academia, and business to advance cutting-edge energy technologies. The 2019 Summit marks 10 years of ARPA-E making ideas into reality, and sets the stage for its next decade of innovation. The 3-day program features inspiring keynotes, practical seminars, a technology showcase with 300+ innovative technologies, and targeted networking opportunities. ARPA-E chose to move the Summit in 2019 to take advantage of all the energy work happening in western states. Denver is an energy innovation nexus in the West, and home to a thriving and collaborative community of technology investors and entrepreneurs. The Technology Showcase displays more than 300 transformational energy solutions from ARPA-E awardees and a highly selective group of companies and research organizations. Many of these innovations are being shown to the public for the first time. The solutions presented present a broad range of advanced technologies, and this year, the Technology Showcase floor will be organized into 11 technology areas. Each year, the Summit features thought leaders in energy and innovation. Previous keynote speakers have included: Bill Gates, Ursula Burns (Xerox), Al Gore, Susan Hockfield (MIT), Elon Musk, T. Boone Pickens, and more! The Summit offers informative seminars with practical solutions via keynote speakers, fireside chats, and interactive panels. The Summit welcomes 50 selected graduate-level students to participate in student-focused programming. Companies with registered attendees are encouraged to meet with new talent through participation in the Student/Company Networking Reception. The Government Agency Networking Program provides an opportunity for energy technologists and researchers to meet with representatives from more than 15 federal civilian agencies and offices within the Department of Defense. The networking lunch enables attendees to discuss research interests, funding solicitations, grants, and other potential partnership opportunities with federal representatives. A variety of tailored networking events take place during the Summit. These events include a Women in Energy networking reception, State and International Event, technology-specific happy hours, and more. These smaller events provide a unique opportunity to connect in a more intimate setting with focused interests. Select technologies will be demonstrating their cutting-edge innovations during 15-minute demonstrations on the Technology Showcase floor. Past demonstrations have included plant-sensing robots, methane-sensing drones, and solar-powered motorcycles. The best way to bring all aspects of the Summit right to your fingers! Attendees have the ability to search areas of interest, message other attendees, have one-on-one meetings and navigate the program through interactive maps and agenda. Partners at the Summit have the opportunity to showcase themselves as leaders in America's energy transformation. Partners have a variety of opportunities available to them during the Summit including the Student Networking Event, Exhibiting, and Sponsorships. Visit http://www.arpae-summit.com for more information and to register today. Please use the email text to promote the Summit to your energy-focused database. The Advanced Research Projects Agency-Energy’s (ARPA-E) tenth annual Energy Innovation Summit is fast approaching! Save the date for July 8-10, 2019 at the Gaylord Rockies Convention Center, just outside Denver, Colorado, to join the best and brightest in energy innovation. The ARPA-E Summit is the preeminent event of the year for professionals addressing America’s top energy challenges and supporting the latest energy technologies as they build a path to the marketplace. The Summit brings together more than 2,000 experts from government, academia, and business for a 3-day program offering informative seminars, practical solutions for break-through technologies, and critical networking opportunities. Don’t miss the 2019 Energy Innovation Summit and register today! After months of planning, the ARPA-E Energy Innovation Summit is almost here! Come join more than 2,000 energy experts from government, academia, and business in Denver, Colorado. Don’t miss our mainstage speakers or outstanding networking opportunities. You’ll see more than 300 transformational energy solutions from ARPA-E awardees and a highly selective group of companies and research organizations at the Technology Showcase, some of which are being seen for the first time.